As you know, the story of PCB contamination of the Hudson River -- and its cleanup -- is long running. Its beginning dates back to the 1940s when companies -- primarily General Electric at its factories in Hudson Falls and Fort Edward -- started releasing the toxic substances into the river. That lasted until the 1970s. Almost 200 miles of the Hudson River were later designated a federal Superfund site. There was a long fight over a cleanup. And the EPA issued a decision on dredging in 2002, with the work aimed at removing PCB-contaminated sediment from "hot spots" in the river starting in 2009. And it's still going. 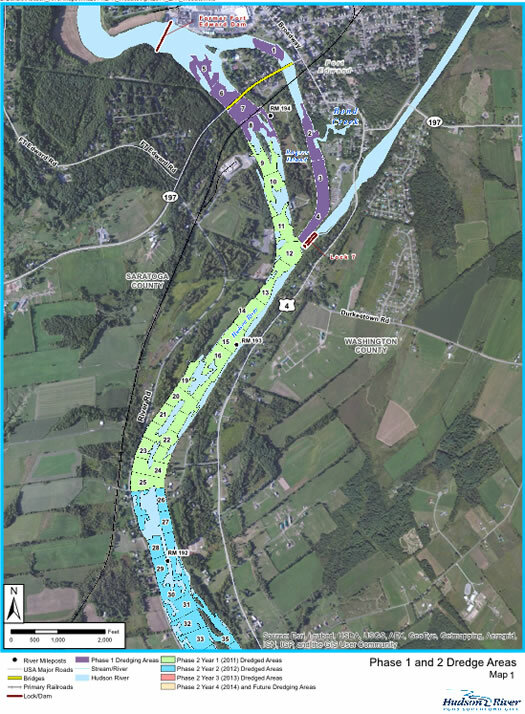 An EPA map of dredging sites near Fort Edward. "The damages that have been felt by Hudson River communities have been enormous," says Andy Bicking, the director of public policy for the environmental group Scenic Hudson. "There has been an entire decimation of the commercial fishery that existed along the Hudson River. There's been lost economic productivity in waterfronts and in what communities can realize in terms of economic development strategies. There's been a huge loss of public enjoyment and use in recreational economy on the river. We can imagine what it would be like environmentally and economically along the Hudson if we didn't have this lasting toxic scar -- I think we could imagine a much more positive, productive environment." So the dredging project has been a major point in the environmental history of the Hudson. And, as currently planned, the dredging is finally scheduled to be finished this year. Scenic Hudson's Andy Bicking takes a long view of the project when advocating for an extension. "The way I like think about it is that this is not our cleanup. If we're lucky, this will be our children's and grandchildren's cleanup, they'll be able to fully appreciate the benefits over time. However, if the contaminants remain in the river, it is no longer our children's cleanup -- at best, it's our great-grandchildren's cleanup. So it's important to get the remaining contaminants out now so that we can realize those benefits sooner rather than later." The Port of Albany as seen from the Corning Tower. This is another one you've probably heard a fair amount about recently. Albany and the Hudson River have become major links for the transportation of crude oil fracked in North Dakota to refineries on the East Coast. The oil is loaded onto trains and moved to the Port of Albany where it's then transferred to barges and moved down the river. One of the complicating factors in the oil train issue is that railroads are regulated by the federal government, narrowing the range of options for state and local officials. 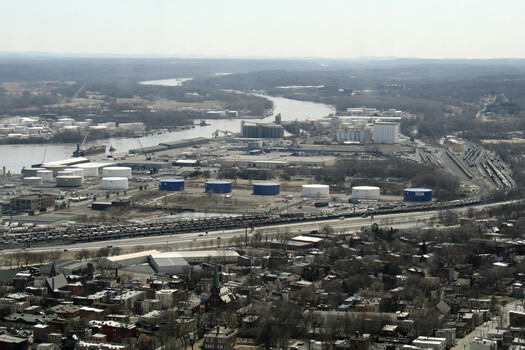 Here in Albany, there's been a lot of focus by community groups and local officials on the oil heating facility that Global Partners wants to build at the Port of Albany -- and the state Department of Environmental Conservation's permitting of the facility. The DEC recently announced there would be a full environmental review of the project. Christopher Len, Riverkeeper's Hudson River program director, sees the ability of local officials and organizations to focus attention on the issue as important. "Drawing the public eye to the regulators that make decisions about these things is a valuable thing that we can all do." Many municipalities along the Hudson River sit atop some very old infrastructure -- especially sewers. One of the issues with some of these old systems is that they combine both storm water sewers and sanitary sewers -- which can have some... unpleasant outcomes. "The basic problem is that when it's dry, those things all go to the wastewater treatment plant and are processed," explains Riverkeeper's Christopher Len. "But when it's wet, there can be more and more water than can overwhelm the ability of the sewage treatment plants to process the effluent and then, rather than have it back up into the streets or into people's homes, it is designed to go through combined sewer outfalls that release the combined sewage directly into the river. So it's completely untreated sewage, which contains all the things that people flush down their toilets, and that contains a lot of pathogens and things that generally speaking will make you sick." As a result, sections of the Hudson River into which these systems overflow can often have relatively good water quality -- but a heavy rain will be followed by a spike in waterborne pathogens. 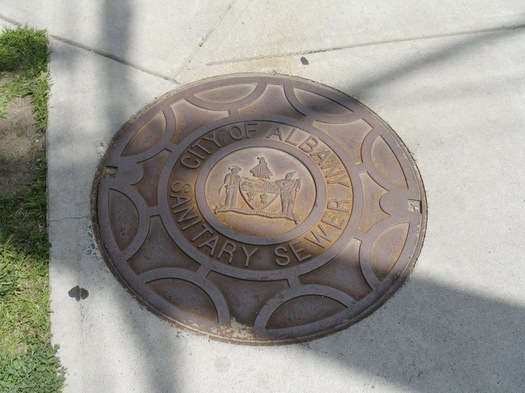 Like many infrastructure problems, the combined sewer overflow issue developed over many years, and fixing the problem is complicated and costly. Len says that means tackling the problem involves municipalities laying out a plan and making incremental improvement over many years. 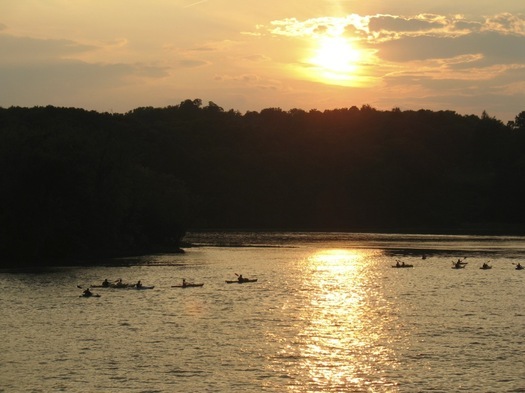 + What's your favorite local body of water?